My weekend was super fun because I actually got to do Girls Weekend with my mom and sister in E’s new town (while my poor dad was cleaning out my grandma’s apartment…). It was so nice to have quiet time with just the three of us and play tourist in my sister’s new stomping grounds. E has a pretty rigorous and time-consuming job, so she gets home pretty late at night and doesn’t want to cook (totally get it). So when we go see her, or when E comes home, we usually bring/send back easy meals that are easy to freeze and reheat. Simple suppers are always at hand and we know that she’s eating a nutritious meal at the end of a crazy long day. Last week, my mom stocked up on ground turkey meat with the intent of making meatballs to bring up to my sister’s place for the weekend. But after a little discussion, we decided that chili would be a better (and more summer-y!) option. Confetti Turkey Chili starts out with the “confetti” – the bright bits of color that give this chili a solid veggie foundation. 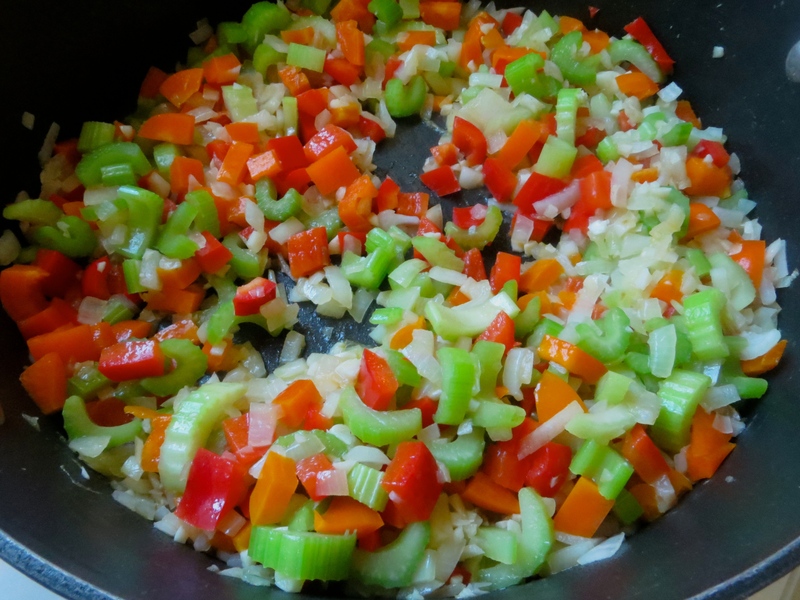 Bell peppers, celery, onions, and garlic. Simple, but so tasty. Plus, this is also a great way to sneak in some veggie goodness into your family’s meal (always an added bonus). When the vegetables get soft, toss in two pounds of ground turkey and use a spatula to break up the meat into smaller chunks. You want to cook ground meat (especially turkey) very well, so be patient – this step can take 5-10 minutes. When the meat has been completely browned, add in a large can of whole tomatoes that you have broken down slightly (more confetti for the chili!). My mom actually uses kitchen shears to cut up the whole tomatoes in the can, but you can cut them up in the can with a knife or crush them with your hands. Your choice! All that’s left is to add in herbs and spices that make it chili! All that’s left is to let the chili simmer a little bit, stir in a can of black beans, and let it simmer some more. Yum! And I love that you can still see all the beautiful bits of vegetable! I love pretty food, don’t you? All that’s left is to dish it up, garnish it, and devour. I added some thick wedges of avocado and a couple of tortilla chips, but you can add whatever fixins’ float your boat! A dollop of fat-free sour cream or Greek yogurt, some shredded low fat cheese, some pico de gallo, guacamole, diced onions, jalapeños, cilantro, etc. The options are endless. I hope you enjoy this easy, quick (and healthy) chili recipe. In a large, high-sided skillet, heat olive oil over medium-high heat. Add in the bell peppers, onions, celery, and garlic. Cook until vegetables become soft and tender, about 2-3 minutes. Move the veggies to the outside of the skillet and add in the ground turkey. Using your spoon/spatula, break the ground turkey into small pieces. Cook until completely browned – this can take a while, about 5-10 minutes (so be patient… it’s all worth it!). When the turkey is browned, add in the tomatoes and the herbs and spices. NOTE – this recipe yields a spicy chili… if you are sensitive to heat, halve the amount of cayenne pepper (you can always add more heat with hot sauce later!). Stir to combine and then simmer for 15 minutes. Add in the black beans and stir to combine. Taste chili to assess seasoning and spiciness and adjust per your tastes – if you want a spicier chili, add in some hot sauce. Simmer the chili for another 15 minutes to let the flavors meld and the beans to heat through. Serve with the traditional chili fixins’ like avocado, taco chips, and shredded cheese. Being an East coast girl, I am no stranger to crab. I saw their shells on the beach when I was little, tried world-famous crab cakes in Maryland in my middle school years, and even have a felt crab hat that I wore for Halloween one year. So all in all, I can say that I am a fan. But my most vivid crab-related memory happened during the summer between my junior and senior years of high school. I was attending a career development camp in the Washington DC-area and our counselors took us all out to a boat/restaurant for a “real East coast experience”. It turned out that they took us to a place that put on a traditional Maryland crab boil – boiled crabs served on butcher paper-covered picnic tables with corn on the cob and new potatoes (to be enjoyed with a tall glass of sweet tea and a billion paper towels). It was a wonderful, messy bonding experience (I had never picked crabs before), but working hard for your dinner got old FAST. So what did I do? I turned to the waiter and asked for crab cakes! And that’s history – I’ve loved the ease and simplicity of crab cakes ever since. Crab cakes seem like a spring/summertime dish, so we whipped up a batch a couple of nights ago for dinner. And what makes these crab cakes awesome is that they are baked and not fried – a healthy alternative to the beloved classic. So now you can feel less guilty about devouring that crab cake sandwich! These cakes start with a simple base mixture. Eggs, bell pepper, red onion, Worcestershire sauce, lemon juice, mustard, sriracha, bread crumbs, and spices. Easy. Then you add in the star! Some good-quality lump crab meat that has been thoroughly picked over to check for shell bits – you don’t want your guests choking on a piece of shell (a surefire way to end a party). And then portion out ¼ cup servings of the mixture, form into cakes, dredge the cakes in a mix of traditional breadcrumbs and Panko (Japanese bread crumbs), and pop them on a parchment-lined baking sheet – make sure the parchment has also been sprayed with cooking spray… this adds to the nice golden-brown crust which tricks your brain into thinking its eating something fried! Bake the cakes for 20 minutes, flipping them halfway through! Perfectly golden brown and delicious. Serve them up as a sandwich or by themselves with some tartar sauce or just a big ole squeeze of lemon. Preheat your oven to 400°. Line a rimmed baking sheet with parchment and lightly spray parchment with cooking spray. In a large bowl, combine eggs, mustard, Worcestershire sauce, lemon juice, sriracha, seasoning, salt, pepper, red bell pepper, red onion, and bread crumbs – stir thoroughly to combine. Gently fold in crab meat until well mixed. Using a ¼ cup measure (or cookie scoop), portion out the crab mixture into your hands. Form the mixture into a patty and dredge in the mixture of bread crumbs and Panko. Shake off the excess and place the crab cake on the baking sheet. Bake the crab cakes for 10 minutes per side until they become golden brown. Flip them over and bake for another 10 minutes. Serve immediately as a sandwich or alone with your favorite sides! I love Pinterest. Seriously, I love, love, love Pinterest. If I could, I would sit around all day and scroll through the millions of crafting ideas, recipes, makeup tips, and exercise regimens. As much as I would like to do this (preferably in my pj’s with a cup of tea and something sweet), I usually just flip through the Food and Drinks category while watching TV with my family at night. I can see what people are eating (or want to eat) and it gives me inspiration to try different meals outside of my cooking comfort zone. And nothing says out of my comfort zone like potpie. Gloopy texture, soggy puff pastry, and tasteless filling… not something that inspires me to dig in. During one of my nightly scrolls, I stumbled upon the most beautiful picture of mushroom-thyme-lentil potpies from Fig & Honey. It was a combination of perfect lentil al dente texture, crisp puff pastry crust, and big Mediterranean flavors. And all I thought was, I want to make that one day. And Sunday was that day. My parents went out to dinner and left me to my own devices. 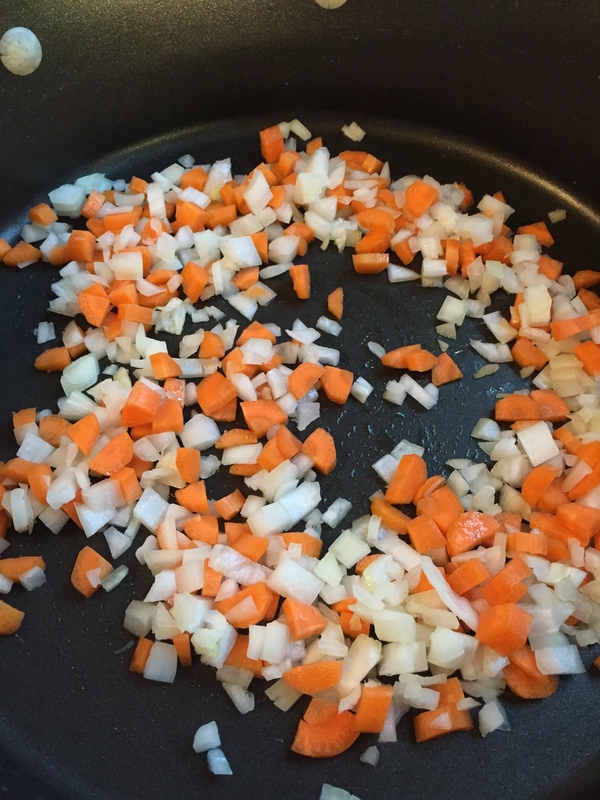 It all starts with onions and carrots cooked over medium heat until they begin to soften. Next, I tossed in some cremini mushrooms and minced garlic. So far, so good! When everything became softened and golden brown, I tossed in some cooked green/brown lentils. The original recipe calls for puy/beluga lentils… which I didn’t find, despite looking at two different grocery stores. I liked how the green lentils turned out in this recipe but if you have puy/beluga lentils, use them! 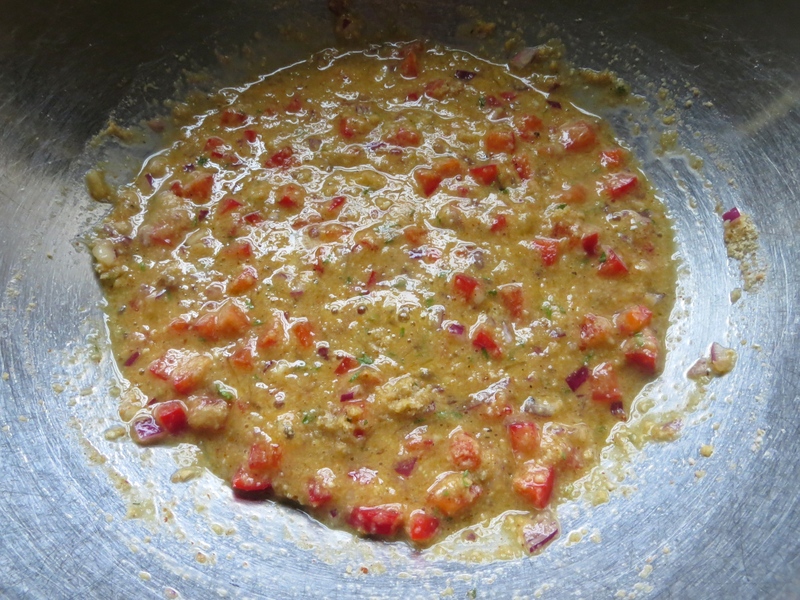 To make the sauce, add in some vegetable stock, soy sauce, tomato paste, dried oregano, salt, and pepper. And some nice dry red wine. For quality control, sample some of the wine (you don’t want to add bad wine to something you would feed your family and friends, right?). To thicken up the sauce, I stirred in a little bit of cornstarch mixed with water – the perfect potpie filling! In a oven-safe casserole, pour in the filling. Top the filling with puff pastry circle, cut a steam vent, brush the top with a beaten eggs and sprinkle with kosher salt and black pepper. A perfectly delicious vegetarian take on a comfort food classic. It was a great way to begin Vegetarianism 3.0 Week 2! 1. Preheat oven to the temperature on the puff pastry box. 2. 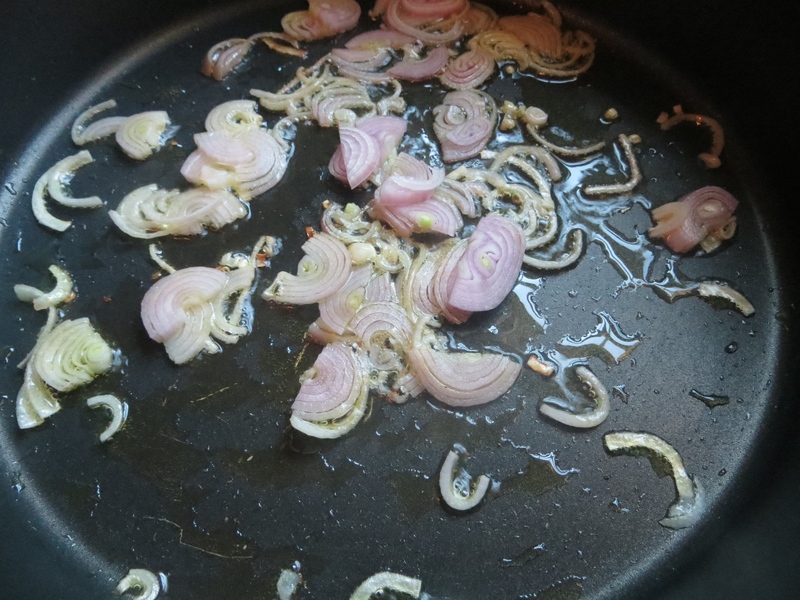 In a large high-sided sauté pan, heat olive oil over medium heat. Add in carrots and onions and cook until soft, about 2-3 minutes. 3. Add mushrooms and garlic to the carrot-onion mixture and cook until the mushrooms soften, shrink, and begin to turn brown, about 4-5 minutes. 4. When the mushrooms become soft, add in the lentils, stock, tomato paste, soy sauce, wine, oregano, salt, and pepper and bring to a boil. While the mixture is heating up, combine cornstarch with a little bit of water to make a slurry. Add the slurry to the potpie filling and continue to heat the filling until it starts to thicken. Once thick, remove the filling from the heat. Taste for seasoning and add additional salt and pepper, if needed. 5. Remove the puff pastry from the fridge and unfold it. Carefully flatten the seams, ensuring that they stay together. Using your casserole dish as a guide, cut out a circle that will be used to top your potpie. 6. To assemble the pie: fill the casserole dish with the filling and top with the puff pastry circle. Cut a steam vent in the top to allow steam to escape during baking. Brush the top of the puff pastry with the beaten egg and sprinkle with kosher salt and black pepper. Bake for 15-20 minutes until the top is golden brown and puffed. Serve immediately. Recipe slightly adapted from Fig & Honey. My mom’s favorite food are the Greek delicacy, dolmathes, AKA stuffed grape leaves. As much as I love the ones that come out of a can, there is really nothing like ones made from scratch. My grandmother, my mom’s mom, makes the best dolmathes … but they are slightly labor-intensive and she doesn’t make them so often. So my mom got grape leaves and told me that we were going to try to make them ourselves… on a Wednesday, no less. My mom and I like the meat and rice-stuffed dolmathes, so in a large bowl combine ground beef, finely chopped onion, olive oil, fresh mint, fresh dill, and some salt and pepper. My grandmother uses the Italian Arborio rice, but we used plain old white long-grain rice. The hardest part of the whole dolmathes making process is the rolling. Here is my mama’s way… (PS – excuse the blurry pictures… this was kinda hard to do one-handed). On a plate, place a grape leaf that has been cleaned, boiled, and cooled completely. Or a grape leaf that has been cleaned, boiled, cooled, and packed into a jar which you can buy at your local grocery store. Whatever floats your boat. Place about less than a tablespoon of filling on the bottom of the grape leaf. Roll up the bottom of the leaf over the filling. And then fold over one side of the leaf over the filling. Continue to roll up the leaf over the filling tightly, until you have a ½ inch left at the top. Fold over the other side of the leaf. Then roll it completely up – it looks like a little burrito! Then place them in a steamer – we placed a colander that has feet on the bottom of our large soup pot. Make sure all the dolmathes are close together. This allows them to steam evenly and not unroll. My mom used low-sodium chicken broth to steam these babies, but you can use water or vegetable stock if your heart desires. Drizzle the dolmathes with another tablespoon of olive oil and weigh them down with an oven-proof plate. This keeps them from unrolling. 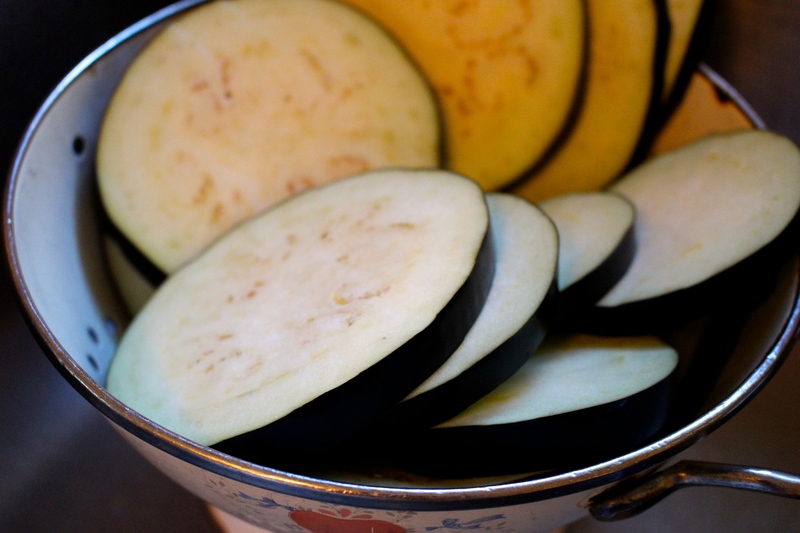 When they are all steamed, pull them out and place them in a pretty dish. And smother with avgolemono sauce (a thick, egg-y, lemon-y sauce that is delicious on not only dolmades but everything). My mom and I mastered dolmades… what dish should we tackle next? 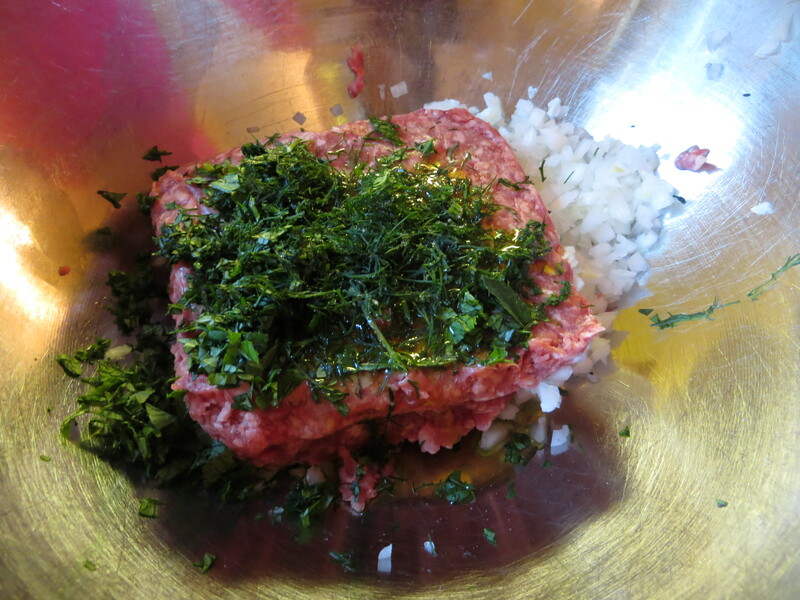 In a large bowl, combine beef, onion, mint, dill, rice, salt, pepper, and 1 tablespoon of the olive oil. Combine thoroughly. Set aside. On a plate, place a grape leaf in the center. Cut out the little stem end at the bottom of the leaf. Place a tablespoon of filling on the stem end of the leaf. Roll up the bottom, and fold over one side of the leaf and continue to roll. When almost to the top, fold in the second side and continue to roll into a burrito shape. In a large soup pot, place a footed strainer in the bottom. Place the rolled grape leaves in the strainer, packing them tightly. When all the dolmathes are in the pot, pour over 1-2 cups of chicken broth and drizzle them with 1 tablespoon of olive oil. Place an oven-proof plate over the dolmathes to weigh them down. Cover and bring to a boil. When the pot comes to a boil, reduce to simmer and cook for 40 minutes to 1 hour, or until cooked through. Serve immediately with avgolemono sauce. Confession #1: This isn’t my recipe. It’s a photo step-by-step of a recipe that Clinton Kelly did on The Chew. We (AKA my mother and myself) made some minor tweaks, but kept the recipe basically the same. You can find the full recipe here! Confession #2: I am taking a big step and trying to use my camera in the “Manual” mode, which makes me slightly unsure of myself (but the pictures look better?). This recipe starts with the veggie portion of the dish. 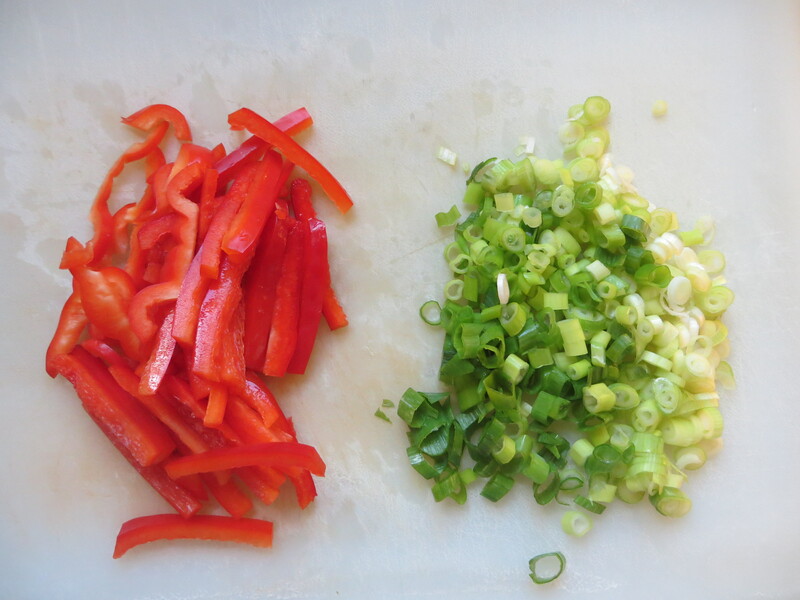 Finely slice up some red bell pepper and some scallions (or green onions… whatever you like to call them!). 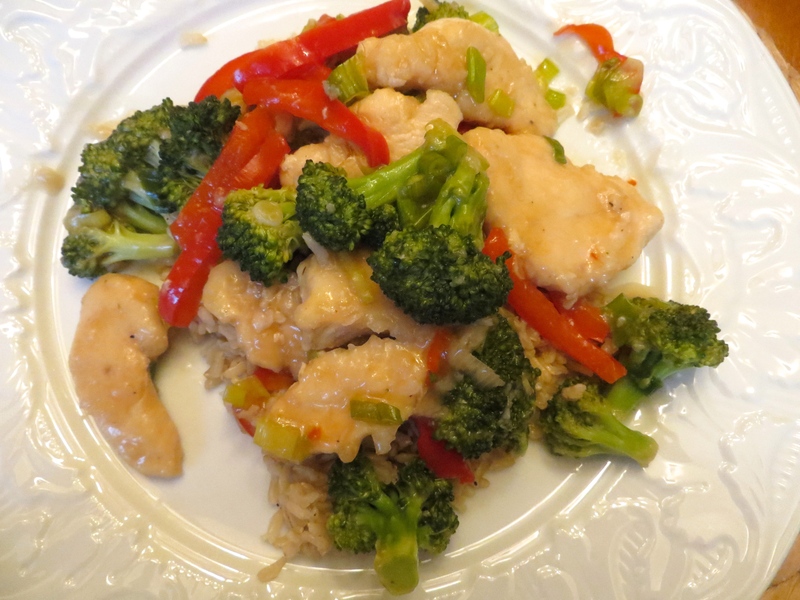 I know that I call this Chicken and Broccoli Stir-Fry, but the peppers add not only a little bit of color, but a nice sweetness and some good nutrition! Then grab yourself some broccoli florets. Or, as they are technically called, the trees. Add the peppers to the broccoli and steam them until they are just starting to become tender. While the veggies are steaming, combine a mixture cornstarch, salt, and pepper. And dredge the slices of chicken breast in it. When they are all coated, let them hang out while the oil heats. When the pan is sufficiently heated, toss in the chicken. This is approximately two large chicken breasts cut into slices, which is pretty much almost overcrowded in this pan. But not to worry! This is a stir-fry. So grab your tongs and stir the chicken around until they become lightly golden brown. 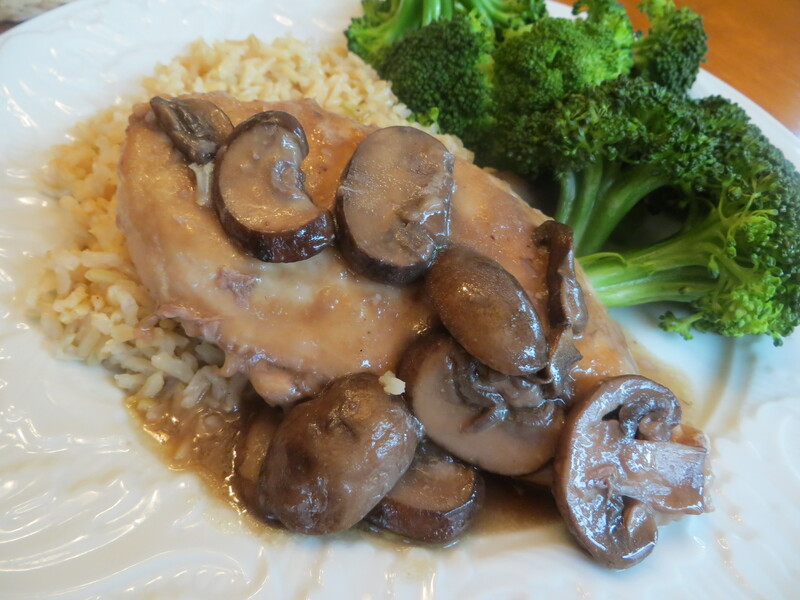 When the chicken has slightly browned, pour in the delicious sauce! And this is what I love about cornstarch in sauces – look how beautifully glossy everything becomes! All that’s left is to toss into the veggies. And serve over brown rice (or any rice you like). 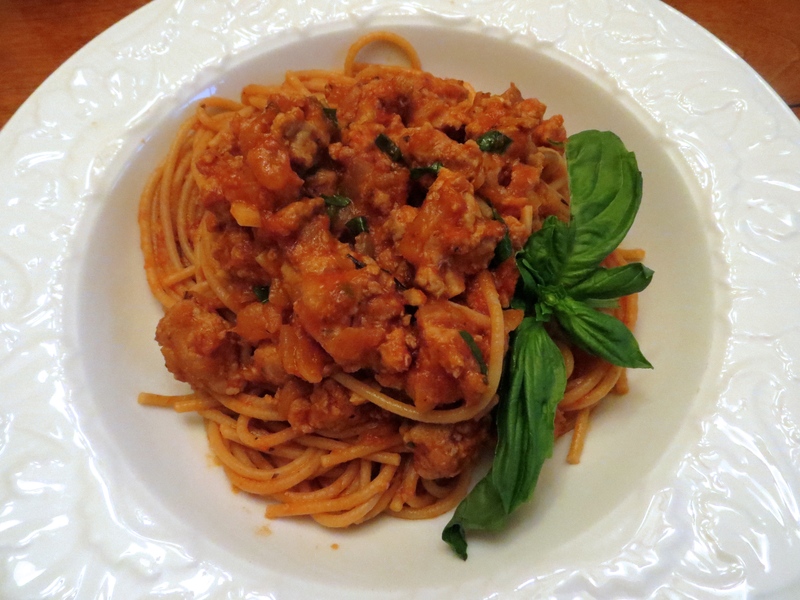 Delicious, nutritious, and quick… perfect for your busy school nights! I hope you enjoy this yummy dish and have an absolutely wonderful Labor Day!